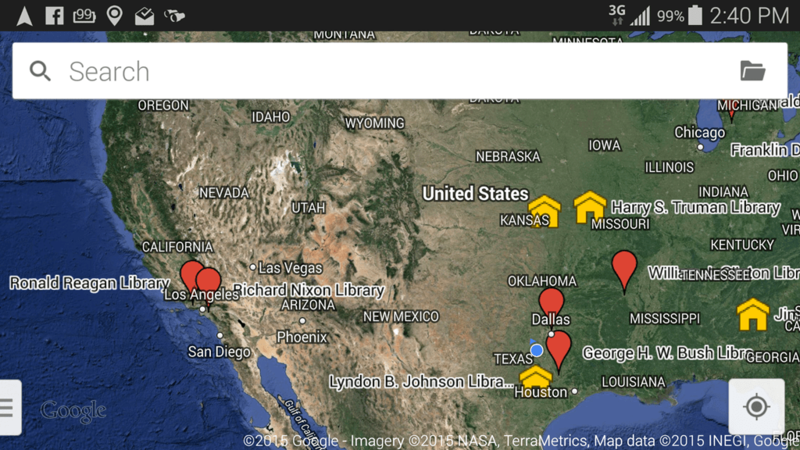 I’ve written about Google’s My Maps in this blog before. As much as possible I am now using Google’s My Maps for planning, and recording, our travels. Something I like to see when working on a plan is the location of all our Thousands Trails membership parks. Below is a screenshot of what it looks like on my phone. 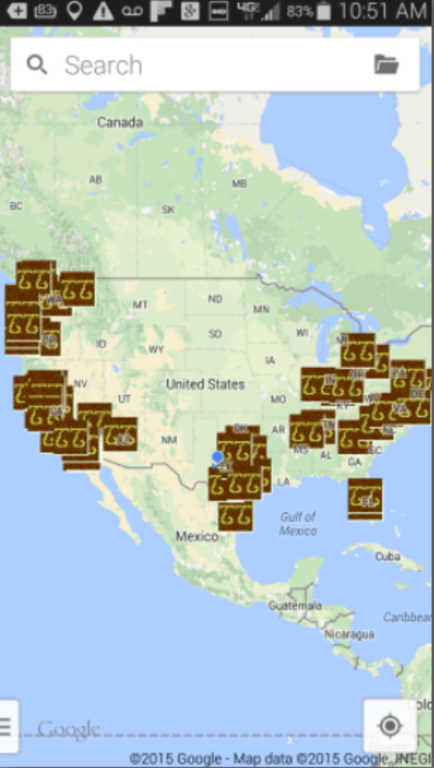 Each brown square has a TT for Thousand Trails. This is stored in a ‘layer’ on my map and I can turn it on or off at any time. I got this data from the Discovery owners website. I used the Google earth format. You can also create your own data set using Excel. 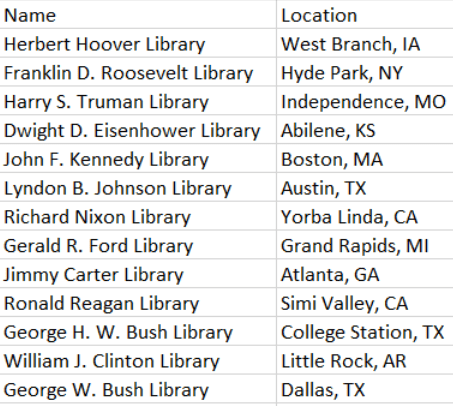 For example, here’s a list I made of all the presidential museums – we’ve visited every one of them! Notice I did not even enter a complete address. Since this information is being imported to Google Maps, it can find the place based on the name and the city. Of course, the more detail you provide, the more accurate the markers will be. Once the data is imported to your map, you can even personalize the icons and make the labels visible. Go to Maps.Google.com on a computer browser – preferably Chrome. Click the 3-line menu at the left of the empty search field and you should see My Maps link appear. Click on that and then Create. Under a new Untitled Layer, you will see a link to Import. Click that and navigate to the file of data you want to import. Depending on the file format, it will ask you which column(s) contain the information for the location of the marker. In the Presidential Museums example above, that would be both columns. Next, you will be asked which column contains the name or label for the marker. In this example it would be the first column with the name of the President. There is a lot to learn about using Google My Maps. If you are a member of Geeks on Tour, there are several tutorial videos on My Maps. Published by MrsGeek, in Blog. Tagged with #GeeksWhoTeach, Custom POI Sets, Geeks on Tour, google, Google Maps, Google My Maps.